Let's get Back to Business! It's time to grow your contact list! Join us for "50 Ways to Grow Your List" workshop - you'll leave with ideas and strategies to capture new contacts, grow your list and take action to help move your business forward. Having an interested and qualified list of contacts, that you can stay top of mind with, is vital to every business. Continuing to grow that list is just as important. 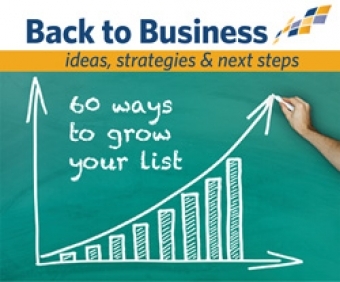 In this workshop we will show you 50 easy ways to grow your contact list today! How to ask people to join your list "face-to-face"